A 'phone tree' is a community developed early warning system. It is an organised way of contacting people in your neighbourhood to make them aware of a threat of fire. You can make timely, informed decisions on what you, your family and your community will do in response to a fire threat. It will prompt you to monitor the TFS website and local ABC Radio Station for Alerts for fire location, speed, weather and direction. A phone tree can be organised with support from the Tasmania Fire Service by a single person or small group of people from your community. The people organising the phone tree collect information about all of the individuals who would like to be included in the list. Ideally, the coordinator will collect at least two contact numbers for each person, including a contact number with an answering machine or voicemail. Once the list of people is collected, it can be divided up to create an organised phone tree network, which is copied and given to all members of the phone tree. Contact your regional Community Development Officer for more information and assistance. Golden Valley is a community who has developed a phone tree network for their area. It is a great example of what a community can develop unique to its own needs. 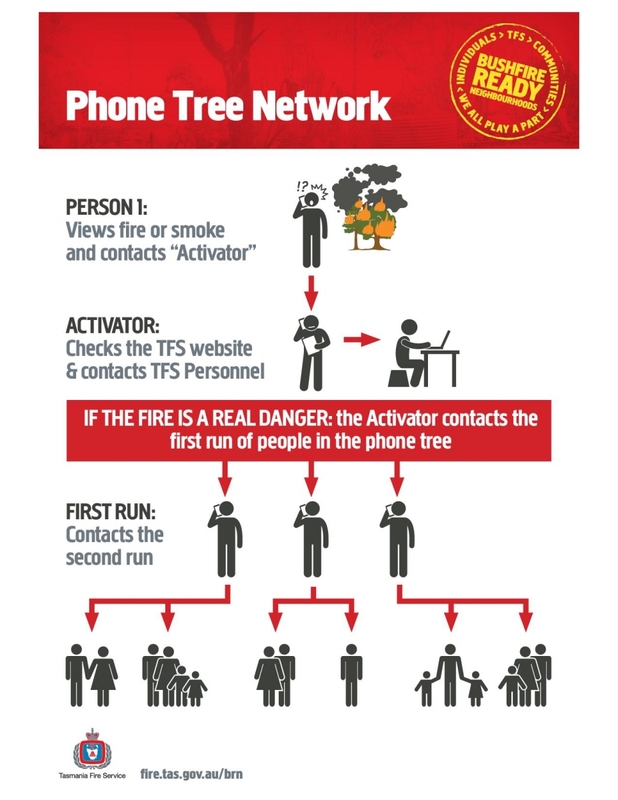 The trigger to activate the phone tree is someone having seen smoke or fire they then contact TFS on 1800 000 699 to check to see if it is a registered burn, if it is not and has been identified as a fire incident then they follow the process as outlined on their 'ourphonetree' website. Golden Valley's system is an effective example of a phone tree that the community has developed and used a few times, most recently in early 2016 when fires impacted their community.